Standby Mode is the Home Screen of the ZLHoop. 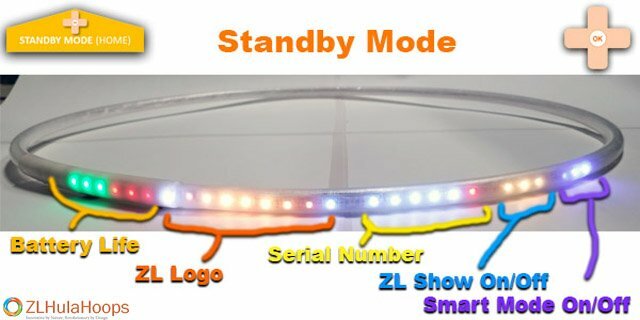 You will see 6 Green LEDS start the LED Strip if your battery is fully charged. Followed by the Orange LEDS showing ZL Logo, then your Serial Number 6 LEDS and finally 2 Sets of Indicators. 3 LEDS either On/Off to let you know what shuffle mode is selected and Gen 2 On/Off Smart Mode showing 3 Blue LEDS. By not turning the Smart Mode off even if you selected Rainbow Mode it will eventually switch back to Single Color Wheel and Then All 9 Color Wheels to Finally do Rainbow again. This happens randomly and allows you to shuffle groups using all 3 Options of the Color Wheel.